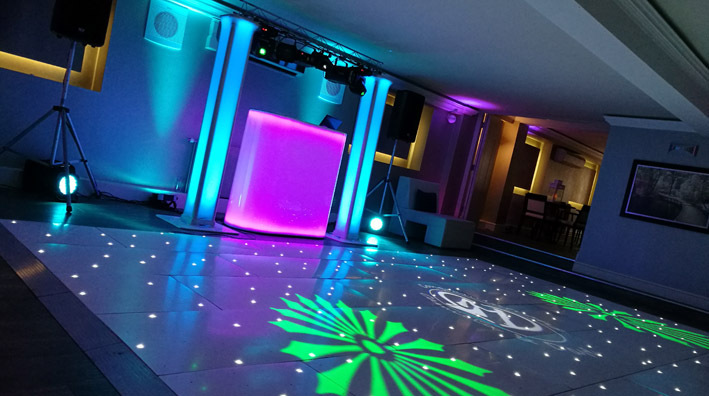 As the recommended Wedding DJ at The Christchurch Harbour Hotel we have a lot of experience working at this venue. 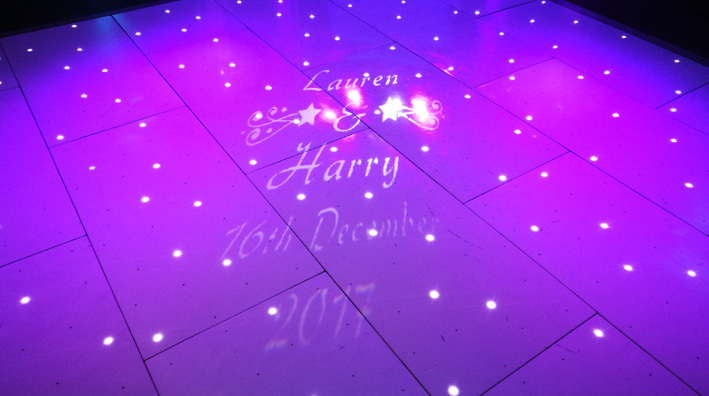 Whilst all weddings are unique, there are some aspects that tend to stay the same or at least similar, in a specific venue. 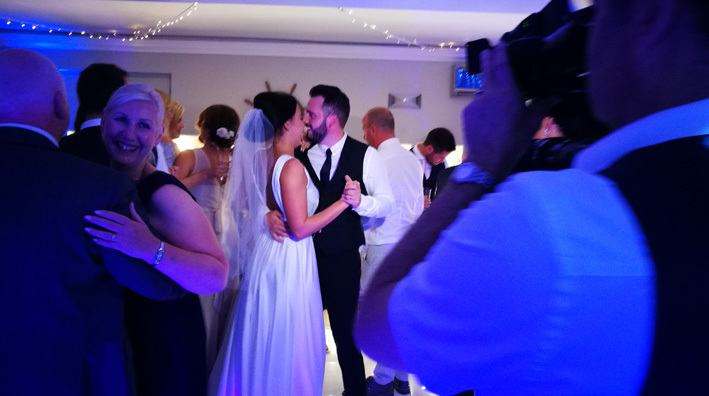 This post will hopefully give you a good understanding of how your event with us should run at The Christchurch Harbour Hotel and what you can expect from us when it comes to your big day and your evening reception. 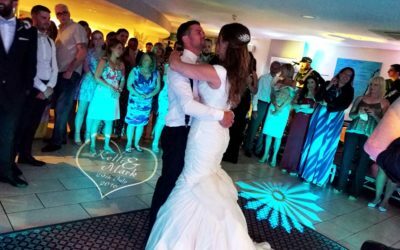 At The Christchurch Harbour Hotel your evening reception is usually held in the Lower Deck, a function room specifically designed for this purpose. It’s neutral style makes it ideal for adding your own personal decorative touch and wedding colour scheme. This is a different room to your wedding breakfast, which is usually held upstairs in the Waterford Suite. 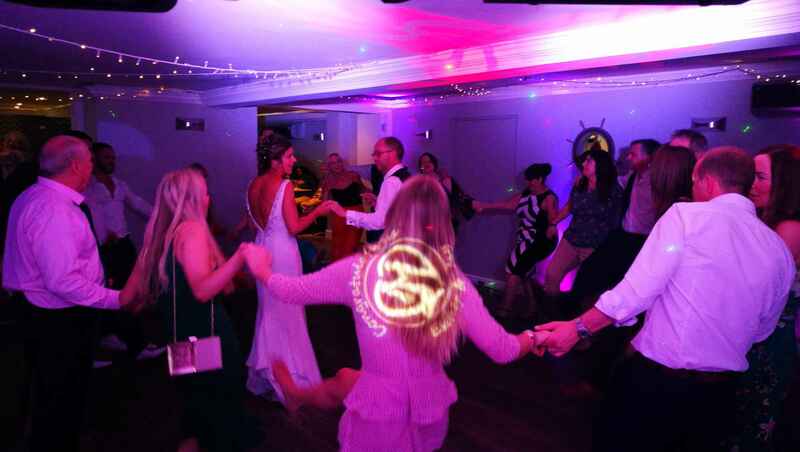 Located downstairs next to the Spa, separate from the rest of the public areas of the hotel, it’s the ideal place for a party. The Lower Deck is usually available for us to access all day. This is really great news because it means there’s no turnaround time while you wait for the tables to be cleared and the disco to be set up. Instead we’ll arrive about 1-2 hours before your start time, while you are eating upstairs. We’ll show ourselves in and have everything set up and ready by the time you come downstairs ready to party. 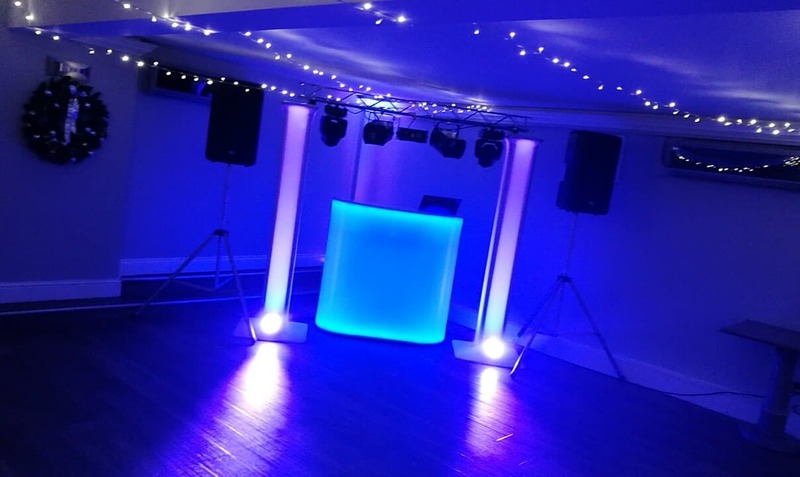 We usually set the disco up in the corner, on the left as you come down the stairs, but if you’re booking our Gold Package or LOVE letters then along the back wall works well too. 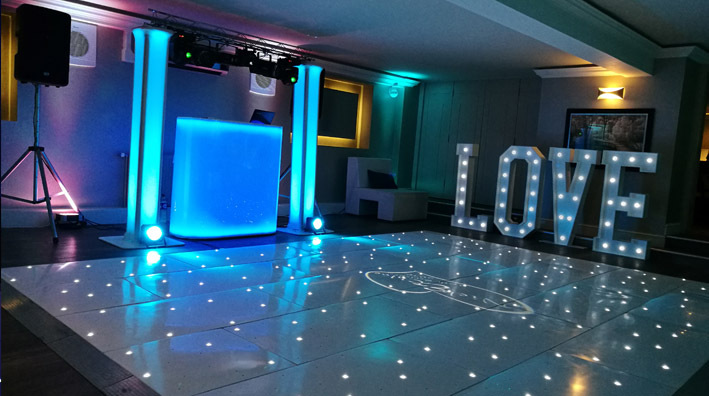 There is a lift available for us, which means our larger items such as the LED dance floor or Love letters are very popular at this venue too. 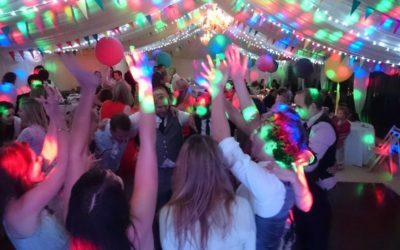 The start time of your disco can vary depending on several factors, such as the time of your ceremony, whether you’re doing formal speeches and how many courses your wedding breakfast is. 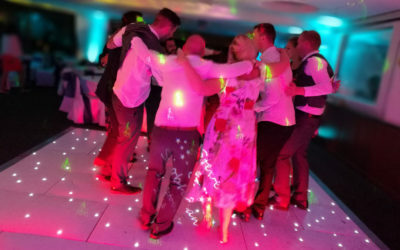 Most of our wedding discos at The Christchurch Harbour Hotel start sometime between 7-8pm but we’ll discuss this with you at the time of booking and can adjust the start time to suit your specific needs. The licence allows us to play music until 12am, which in our experience is the perfect time to end the day. The music here must be lowered slightly at 11.30pm, to abide by the venue’s sound restrictions but the party can still continue on until midnight. 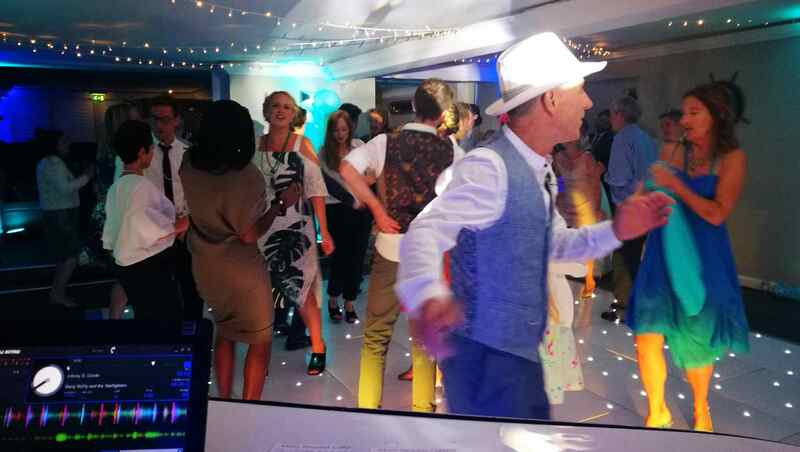 One of the things we love about The Christchurch Harbour is how flexible the function room is, making it suitable for all our wedding DJ packages. 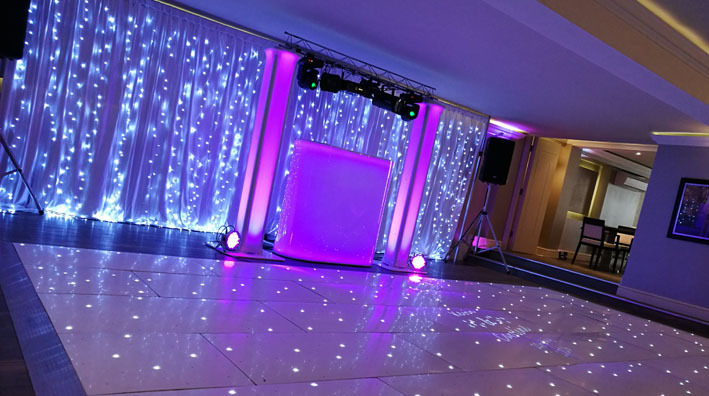 Our Silver & Gold Packages are by far the most popular here because our unique GloBooth gives you a modern, tasteful-looking disco and our LED uplighting allows you to illuminate the room in any colour you choose. 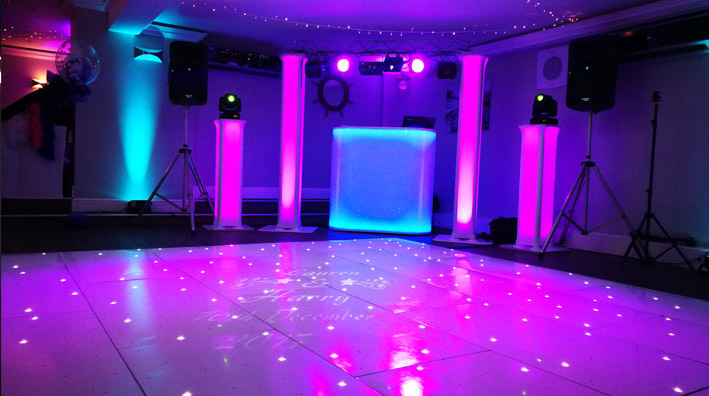 Adding a splash of colour and creating the perfect party atmosphere. The Platinum All Day Package also works well at this venue. The details vary depending on your own unique needs and timings so give us a call if you’d like to chat through the options for your big day. 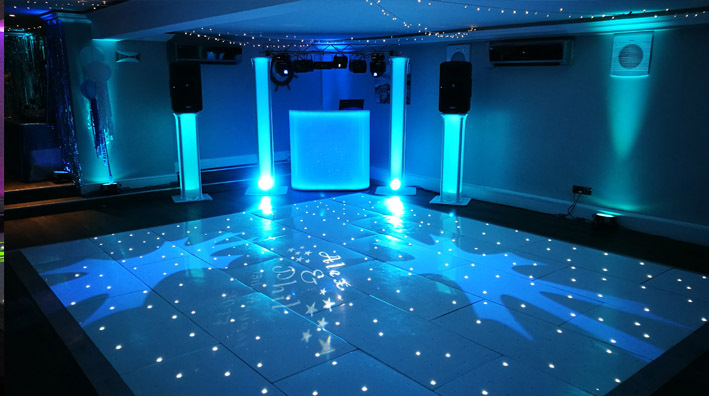 Click here to see full descriptions of all of our Wedding DJ Packages. 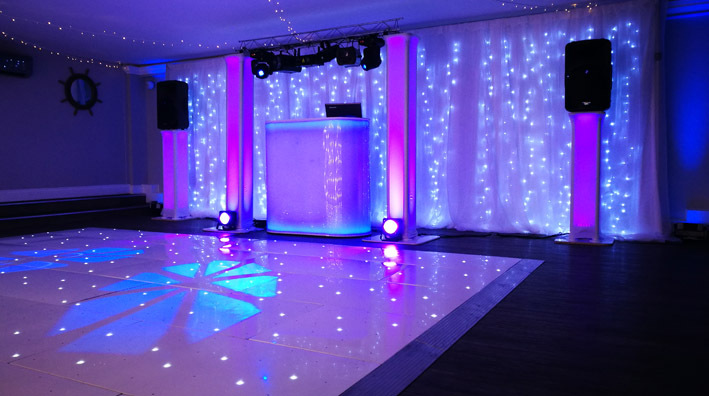 Hugely popular in this venue, our LED uplighting can match your colour scheme or add a splash of any colour to your room. 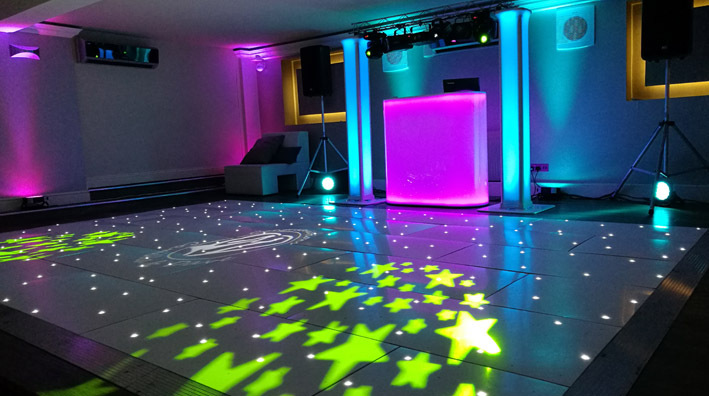 Positioned around the edge of the room, these small lights shine upwards onto the walls, adding to the atmosphere and tying the whole room in with the disco area. 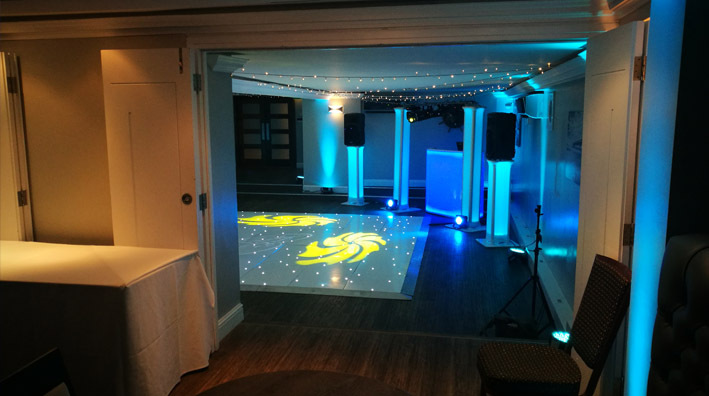 The Christchurch Harbour Hotel has a wooden floor suitable for dancing, but no actual dance floor making our portable dance floors a popular choice here. 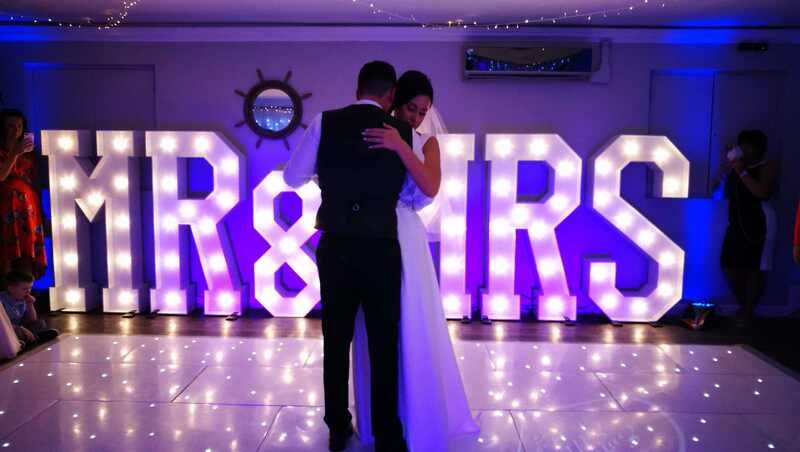 Choose from black, white or chequered and plain or twinkly LED to add the finishing touch to your wedding reception. Another popular choice at The Christchurch Harbour Hotel are LOVE letters. These work really well along the back wall in the Lower Deck.